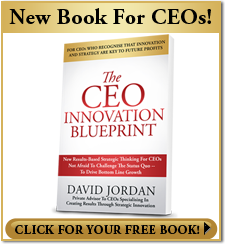 “The CEO Innovation Blueprint” tries to bring in CEOs back into thinking about not focusing on innovation but actually solving the customer’s problem. It’s ironic that in an age that we talk about that “We’re customer-centric, we’re customer-focused. The customer is always right,” that we actually don’t think about solving the customer’s problem when we are innovating. A very good example of this one I’d like to use is about the kettle. People don’t want kettles, they want hot water. Business problem is: “I want to make a cup of coffee. I need hot water. And the solution I find to today is that I use a kettle.” Now when companies are thinking about that we’re solving their customer’s problem, what they’re actually thinking is that the kettle is solving the customer’s problem. They think that the customer wants a kettle. Their focus is around “We make kettles, we sell kettles.” It’s all about the kettle. And they forget about the customer. And it’s a very good example of when you’re innovating step back and remember, it’s the customer, not the product that you’re innovating. So the problem is what’s happened is that the customer was trying to solve the problem of how to make a cup of coffee. Somebody came along with a coffeepot machine, it boiled the water, made the coffee without any need for a kettle. So the problem is that the kettle became redundant and the company that was focused on the product instead of solving the customer’s problem actually started losing market share. 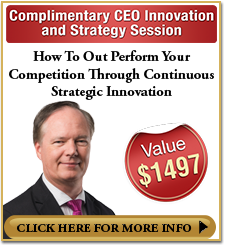 One of the topics we raise in “The CEO Innovation Blueprint” is we say you need to focus on what the customer wants. The challenge is that the customer doesn’t always know what they want. Very good example is Henry Ford. Henry Ford said, “If I asked the customer what they wanted, they would’ve said, ‘A faster horse.’” They didn’t know what a car was. If you actually looked at what Steve Jobs did with Apple, did Steve Jobs go out to the customers and say, “Do you want an iPhone?” They don’t know what an iPhone was. They didn’t know if they needed an iPhone. What Steve Job actually focused on was to ask people, “What are your problems with the mobile phone?” The screen’s too small, or can’t read the writing, or it’s difficult to use the keypad on the phone, or there are not enough right apps for it. What Steve Jobs was actually trying to do is not ask customers what they wanted but to understand deep down what the problems were that even maybe the customers didn’t actually understand themselves. So it’s very important, not only saying “understand what the customer’s problems are” but to actually really dig deep and understand the underlying problem, not just what you see on the surface. The other problem that we see today is a lot of discussion around big data. And a lot of companies are refocused on using big data to try and understand their customers. And there’s a lot of benefits in it. I’m not trying to discount it. But one of the problems is big data is recording what the customer does. So if you’re a kettle company, you’re watching the customers buying kettles. How is big data telling you that a customer could see a coffeepot machine that can do the job without the need of a kettle? And it’s very important to be careful with big data to not be coned into following what the customer’s doing because they don’t know that there’s something else that they can do instead. Another issue we talk about with “CEO Innovation Blueprint,” is to again, is to re-step back and understand what we’re trying to solve for the customer. In banking we have products like Medical Loans, or Mortgage Lending, Business Loans. The thing is the customer doesn’t wake up in the morning and says; “I want a loan.” What they want is, “I’d like a new car. The old car keeps breaking down. I need a new car,” or “I want to go into new business,” or “The family’s outgrowing the home, we need a new house.” So the problem that’s being solved is that they want to do something, they want to buy a house. 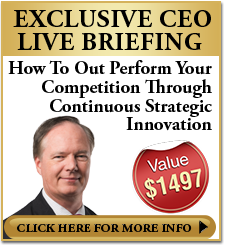 “CEO Innovation Blueprint” is really trying to help the CEO to actually become the innovation leader of the business. Not to be the Innovative but to actually drive the organization to be creative, to be involved in continuous innovation, to challenge the status quo. So the role that the CEO has to be to challenge their executive, to challenge the staff, to get the executive to be challenging the status quo, to get the executives in overcoming fear of staff, and overcoming their own fears. To actually make the company successful, it’s really important to really challenge the executive team to step outside of their normal boundaries. When you go into look in business, it’s very process-oriented. The whole management structured from top to bottom is about the business process. I make widget X, I sell widget X, we manufacture widget X, we have production line issues, the computer systems fail, we’ve got to get the payroll run. It’s all process driven and it’s really difficult to step out of that and think about strategic planning, strategic growth and innovation. It’s very hard when you’re worried about we’ve got to get the payroll out and the systems failed to be thinking about how do we solve about this customer’s problem? So it’s really important to try and drive that executive to step back, and refocus, and re-energize in thinking about the customer, in thinking about solving the customer’s problems, rather than internal business problems. One of the examples that we try and talk in “CEO Innovation Blueprint” is how we’ve become so driven by the process, so driven by the policy that we’ve forgotten the customer. A very sad example, and a very poor example of what happens when policies overtake common sense, was a situation on Southwest Airlines recently. The policy stated that if a passenger is in danger that the crew can talk to the pilot. The passenger wasn’t in danger, the husband was in danger. So we have a very sad situation where a passenger is in tears the whole way through, gets home to find that the husband had committed suicide. We had all these policies in place that people follow for very valid reasons but we didn’t solve the customer’s problem and it’s a very glaring example of how we become so focused on the policy that we forgot the customer.